This Carlisle Cathedral print will make a fab addition to your home, especially if you live in Carlisle, Cumbria like me. If not, it will provide you with a stunning scene of a spectacular cathedral, that will bring sunshine to your day! 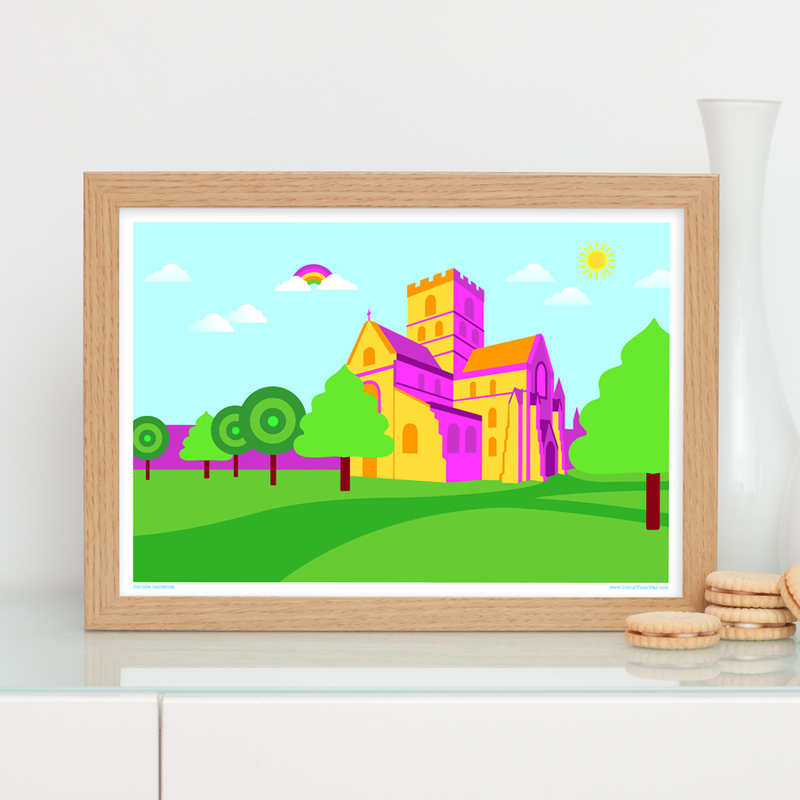 The design shows a colourful illustration of the cathedral, in vibrant greens, pinks, purples, oranges and yellows. The sky blue background is gorgeous, finished with a fun rainbow, fluffy clouds and a glowing sun. The print is available in 7×5 inch unframed, 7×5 inch framed, A4 unframed, A4 framed and A3 unframed. If you choose the 7×5 inch or A4 framed print, the frames have a beautiful oak finish as shown in the photo. The 7×5 inch frame measures 205mm x 155mm and the A4 frame measures 325mm x 235mm. The frames can be hung on a wall but also have a stand on the back so they can be stood on a flat surface. Please note, framed prints are available for UK delivery only. Be the first to review “Carlisle Cathedral Print” Click here to cancel reply.